Up North is becoming a competition favorite. It's called hard alcohol, but when the owners of Up North Distillery clean the still, the aroma that emanates from the doorway is soft and sweet, like grandma's apple pie fresh from the oven. That might be enough to lure locals, but there's more than just alcohol production going on at Up North, which owners Randy Mann and his wife Hilary created three years ago in an industrial park north of Interstate 90 near State Line. Armed with a liquor license from the get-go, they recently added a separate retail space. Up North is one of a handful of distilleries where thirsty customers can see the product being made, have a signature cocktail and then grab a bottle to go. Many of their bottles have earned awards for the first-time distillers, six of them from the 2018 American Distilling Institute competition. 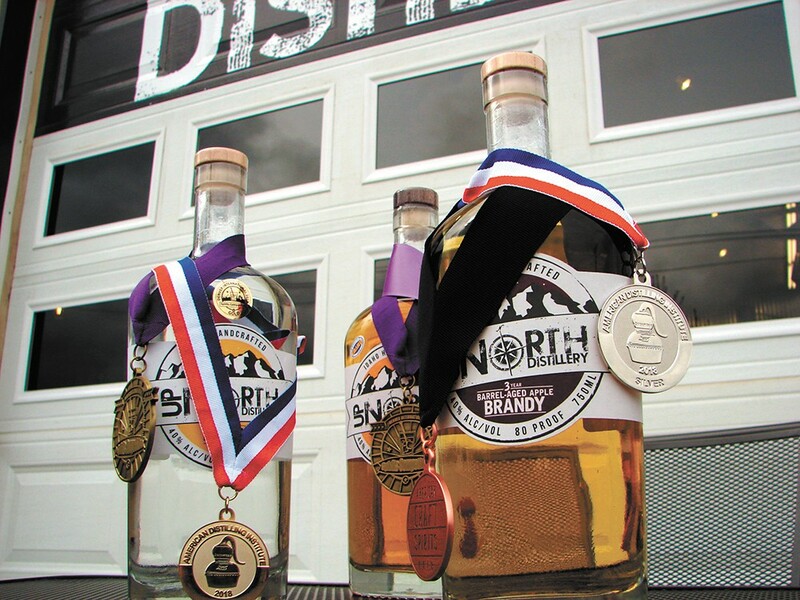 In addition to Gold Medal and Best Of awards in the specialty spirits category for their honey spirits, Up North took home three bronzes (for the Barrel Reserve Honey Spirits, Big Kid Cider Apple Brandy and Apple Brandy) and a silver (for their 3 Year Barrel-Aged Apple Brandy). To date, they're also one of only eight distilleries in the Gem State. Why? Well, the rules for distilleries are complex, including how and where spirits may be sampled, sipped and sold. A properly licensed brewer can tap their own keg and fill a glass or growler, for example, while a distillery cannot, unless they prove their agility navigating the legislative maze of regulation in a still-evolving craft-distilling industry. In Idaho, distillers must buy their own alcohol back from the state but cannot sell it on-site unless they have a separate business and retail location. Moreover, to sell hard alcohol for on-site consumption, one must have the all-important and sometimes hard-to-obtain liquor license. "It sounds convoluted, but it's a great system," says Randy Mann, who likens Idaho's approach to neighbors like Montana, Oregon and Utah, all alcohol-control states. Another distinction: Up North is one of six distilleries nationwide that create honey-based spirits, and their honey, like their apples, is all sourced locally with great attention to detail. "To be a true craft distillery, you have to be small-batch," says Hilary, "and you have to make it yourself." Some distilleries purchase spirits and bottle them under their own name, says Hilary. The Manns, though, put the work in themselves, taking classes — look for Randy's framed, Moonshine University diploma on the wall — and doing the heavy lifting required of expanding their offerings. To help them expedite their latest venture — adding bourbon and whiskey to the mix — they've installed three gleaming metal silos outside their Post Falls facility (eliminating actual heavy lifting, jokes Randy). "It's way easier to pump grain out of a silo than to sling 50-pound bags over your shoulder," says Randy, an Avista lineman. Both he and Hilary, a school counselor, work full-time jobs in addition to running the distillery. The original print version of this article was headlined "Northern Exposure"